This is how the perfect breakfast begins. Photo: Peter Weltman. SHANGHAI, China – When my brother Trevor was stationed as a student ambassador at Shanghai's World Expo, I finally had a chance to eat my way through Asia for the first time. Not only is he is a proficient Mandarin speaker, he is another thing that I am not: a vegetarian. This made me nervous. Would philosophical differences in gastronomic preferences damper my exploration? Hardly. Together we indulged in stinky tofu and zhong-zhi (rice dumplings), and I went solo with tea-roasted duck and seared baby chicken. When I tagged along on his breakfast routine, and we found another mutual love: jian bing. We crossed the cobblestone streets of Shanghai's French Concession and arrived at a small nook between rows of larger shops. At 8:00 a.m., the line held a few morning stragglers; Trevor said it would have been much longer during the early rush. Anchoring the booth was a large, rounded flattop almost two feet in diameter. Our breakfast shifu (master) ladled batter onto the smoldering surface and, using a wooden tool, made circular motions until if formed a paper-thin layer. Wasting no time, she cracked two eggs on top, broke the yolks, and slathered them across the surface. For condiments, she painted on two sauces — one of hot chili and the other a salty bean paste — then added chopped cilantro and scallions. Finally, crispy fried flat bread ran from end to end and, in three folds, she put our meal in a pink bag, and we were on our way. 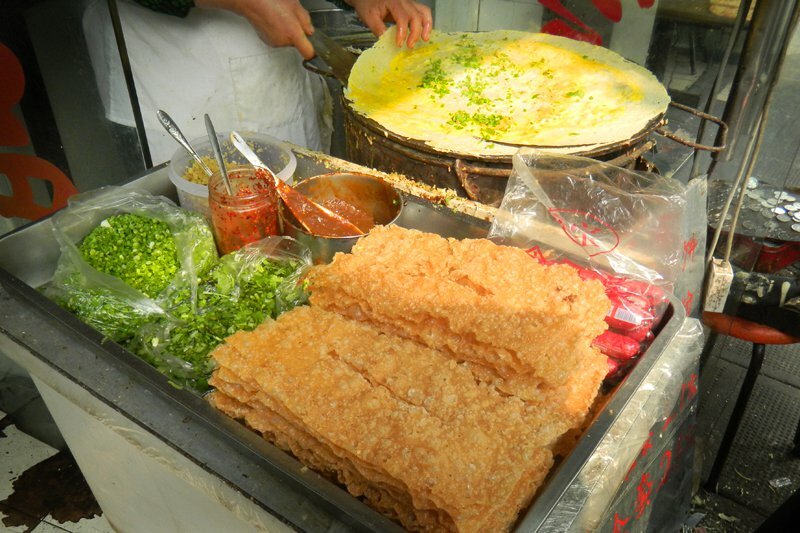 I ate jian bing every day for the remainder of my trip. I learned to love savory breakfast while working on an Israeli kibbutz, where salads and cheese were the morning norm. Jian bing appealed to my tastes, but was spicy, rich, and satisfying with flavors that only Chinese cooking can achieve. Much as I started ordering cortados back home after a summer working in Spain, I needed to find a way to make jian bing part of my American life. And what better place than New York City to find this ubiquitous Chinese breakfast, right? Wrong. After failed internet searches, I scoured Manhattan's Chinatown, peeking into restaurants, asking street-food venders for tips. I was totally unsuccessful. I feared the flavors of jian bing were lost and would only taunt my imagination. I ventured to Chinatown in Flushing, Queens. On the third trip, as I was ready to throw in the towel, I walked into a random food hall, looking for dumplings and scallion pancakes, when I spotted a girl doing the unthinkable: eating jian bing. My heart racing, I nervously approached her. She confirmed that it was jian bing and directed me to a nearby counter. I literally danced. After I ordered and paid $2.50, I used a newly acquired Mandarin phrase, xièxie (thank you). Jian bing was now a subway ride away. I felt complete. But I wanted more, and I got it: Shortly after my one-year anniversary with this redefining breakfast staple, Trevor had a surprise for me. His new Chinese language partner, Yu, had prepared a cooking lesson for me — and jian bing was the featured item. Traditionally, jian bing in China has fried bread in the middle, but this version is satisfying and uncomplicated to make. 1. Put vegetable oil in a small sauce pot, over medium-low heat. Add both sauces so they gently sauté. After ten seconds, add water and simmer until sauce thickens slightly, about three minutes. Reserve to the side. 2. Combine all three flours into a bowl and mix with chopsticks. Progressively add water and continue to mix with chopsticks. After all the water is poured in, use the back of a spoon to press out clumps. The batter should be runny and smooth. 3. Add just enough vegetable oil to coat the bottom of a 10-inch non-stick sauté pan. Put over medium-high heat. Give the batter a quick mix and start pouring in the center of the pan, followed by concentric circles towards the pan's edge. If necessary, lift the pan and allow batter to fill in any cracks in the crêpe. It should be a uniformly thin layer. 4. Add egg to the top and, using back and fourth motions, break the yolk so the egg adheres to the entire surface. After about four minutes (or when the bottom starts to become crispy), quickly flip the jian bing to finish cooking the egg. 5. Flip back so crêpe is egg-side up. Using a brush or a spoon, paint on a thin layer of reserved sauce. Then add cilantro and scallions. 6. Although folding varies from city to city, I find this to be the easiest: Fold crêpe in half, and then fold it again into fourths. 7. And as they do in China, grab a small plastic bag and take it on the go. Peter is a server at the three-Michelin star restaurant Eleven Madison Park in Manhattan, and is working on a restaurant cookbook interviewing farmers, fisherman, ranchers, and artisans around New York state. He travels to compression-pack his clothing, get dressed up to fly on airplanes, and for new flavors.